A retractable awning, patio awning, pergola awning or folding arm awning will extend your outdoor lifestyle. A retractable window awning or blind provides shade without shutting out the view. 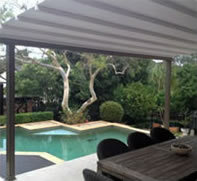 Retractable awnings give you control over the Sydney weather on your own terms. When the sun gets too hot you can unroll the awning to provide instant protection and shade. An optional sun sensor can automatically extend the awning in the sun and an optional wind sensor can retract a folding arm awning in windy conditions. Awnings keep temperatures cooler inside and help reduce your electricity bills by up to 25% if you run air conditioning. 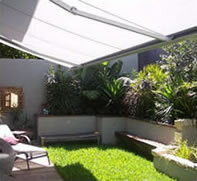 Retractable awnings can provide shade without shutting out the view. Awnings protect floor coverings and furniture from fading in sunlight. Awnings are environmentally friendly way to cool your home. A retractable awning can give excellent privacy when required. An awning can add value to your property. Retractable awnings can turn terraces and balconies into airy attractive, extra rooms. Awnings provide a sheltered place for children and pets to play, shielded from direct sun. Retractable awnings and exterior blinds reduce thermal heat gain and increase the energy performance of a building. 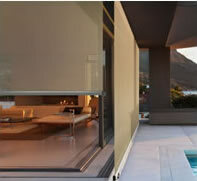 Ozsun’s awnings and external blinds can reduce solar gain by up to 80% by keeping the sun’s rays off the glass. This is far superior to using thermal pane glass, window tints or internal blinds. 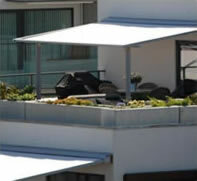 Folding Arm Awnings maximise entertaining areas such as patios and decks, and are also ideal for cafés and restaurants. 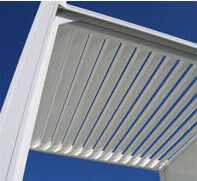 Retractable roof awnings are a concertina style retractable roof or pergola awning that fold the fabric back in pleats. Conservatory awnings are commonly used for shade over pergolas but can also be fitted with posts. 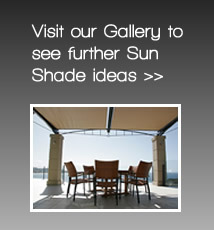 Ozsun Louvre Roof will create your new favourite outdoor room. Let your life flow seamlessly from the kitchen dining area and out on to your covered patio. 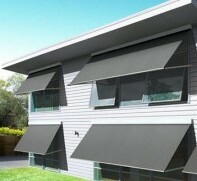 Straight Drop Awnings are also called External Blinds & Shutters. The advantage of an external blind is that it keeps the sun off the glass and is far more effective at reducing heat than an internal blind. With a variety of fabric options Pivot Arm Awnings offer adjustable sun control, privacy, and view through whilst allowing airflow behind the awning.